Fundamentally revising our understanding of the nature and intellectual contours of early English Protestantism, Karl Gunther argues that sixteenth-century English evangelicals were calling for reforms and envisioning godly life in ways that were far more radical than have hitherto been appreciated. 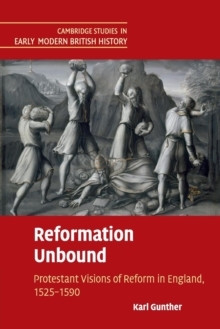 Typically such ideas have been seen as later historical developments, associated especially with radical Puritanism, but Gunther's work draws attention to their development in the earliest decades of the English Reformation. Along the way, the book offers new interpretations of central episodes in this period of England's history, such as the 'Troubles at Frankfurt' under Mary and the Elizabethan vestments controversy. By shedding new light on early English Protestantism, the book ultimately casts the later development of Puritanism in a new light, enabling us to re-situate it in a history of radical Protestant thought that reaches back to the beginnings of the English Reformation itself.